Imagine – You have a mouth full of things to say, but you are not allowed to speak. Your fingers are full of colors, but you are forbidden to paint.. Your body is full of passion, but too scared to move. 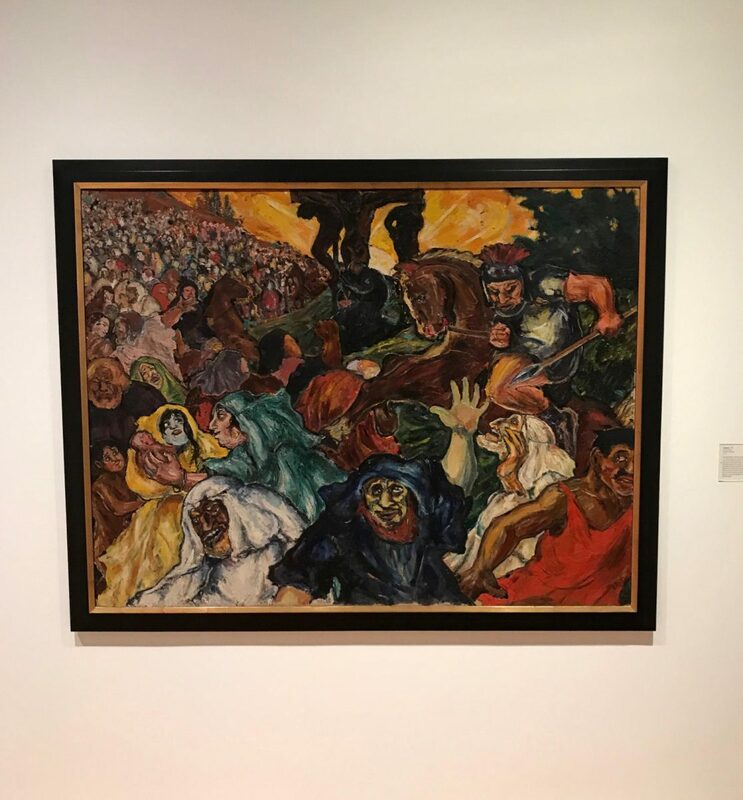 For German-Jewish painter Fritz Ascher, one of the many gifted painters ostracized and persecuted during the Nazi era, this dissonance symbolized a larger heaviness throughout this period. Forced to flee into hiding, he put a hold on the powerful figural compositions he had created during the Weimar years. Ascher survived, and came back after these visually quiet years (in which he wrote poems) with landscape paintings full of vigorous brushstrokes and expressive colors. For the first time in the United States, one can eye Fritz Ascher’s life’s work in person at the New York University’s Grey Art Gallery in New York. Initiated by Rachel Stern, Director of the Fritz Ascher Society, an institution which researches, exhibits and publishes the work of artists suppressed by the Nazi regime, the exhibition is on view until April 6 in this neat fine art gallery in the heart of Manhattan. At the opening on January 8 the house was buzzing with more than 300 curious visitors of all ages. “I don’t have much artistic training formally, but I know when something moves me emotionally”, said Lisa Lipkin, who bought some of Fritz Ascher’s early drawings on paper. “I am amazed how open and enthusiastic people here are – about an artist they’ve never heard of”, smiled Rachel Stern, who greeted guests along with Lynn Gumpert, Director of the Grey Art Gallery. There was not always such unbroken enthusiasm for the German-Jewish Expressionist, recalled Ms. Stern. Thirty years ago, she had her first encounter with a Fritz Ascher painting, who was born in 1893 in Berlin, and died in the same city in 1970. It was one of his later paintings, an atmospherically dense landscape, which the painter crafted in his second period of work after the Second World War. “I couldn’t find a lot of information and public interest”, remembered Ms. Stern, who was young art historian in the 1980s. “It seemed that Hitler succeeded in silencing artists like Fritz Ascher.” So, she started doing some research, knocking on Ascher’s neighbors’ doors, even publishing want ads in Berlin’s newspapers to find interview partners who could tell her more about the once-so-bustling painter who had studied with Max Liebermann and Lovis Corinth. Step by step, she unraveled more of his history, leading her to more of his paintings. In her search for collaborators, she encountered many more artists like him who were forced to hide or escape from the Nazis and are nearly forgotten today. “The Fritz Ascher Society dedicates itself to these unknown artists. I don’t want them to sink into obscurity, I want to make them accessible to a public audience”, said Ms. Stern. Amongst the playful and curious chatter between gallery-goers, many of whom did not arrive with any preconceived notions about his work, were visitors whose grandparents or great grandparents died in the Holocaust. For Lisa Lipkin, the child of a Holocaust survivor, Fritz Ascher’s work is not only touching, but incredibly relevant today. In a world were right-wing movements are gaining ground, Ms. Lipkin noted, Fritz Ascher seems to be part of the ongoing struggle between tolerance and suppression. To see more about the exhibition click here! To learn more about specific dates and times, visit our Wunderbar Together Event Calendar or click here. Moritz Simon Geist and his robots performed at several venues at this year’s SXSW, including a set at the opening of the festival and a headlining performance entitled “Tripods One” at WUNDERBAR: German Music Night held at the German Haus.